At the end of last year, our panel selecting their best new NSW beers of the year threw something of a curveball. Modus Operandi has, more than anything else, made its name on the back of a series of fine hop forward releases. Yet the panel chose to highlight the Mona Vale brewery's darker side. 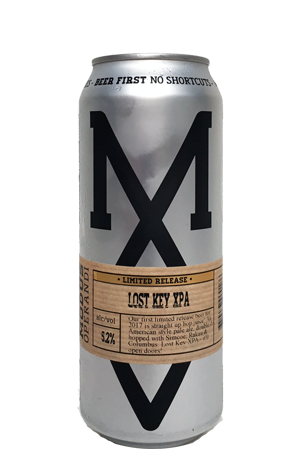 For the first limited run can release of 2017, however, it's back to their beloved little green flowers in the shape of Lost Key, an XPA first brewed with Black Bunny Kitchen from the Sunshine Coast late last year. XPAs (or extra pale ales) typically sit somewhere between a pale and an IPA; given the magnitude of some of Modus' IPAs, you'd say this one operates closer to the pale ale end of their spectrum, albeit still loaded with plenty of American and Kiwi hops. They're calling it "hop juice" and, certainly, it stops off at various points in the hop spectrum while making its way from can to glass to olfactory system: tropical, piney, grassy, resinous, grippy – you'll find it in there. That said, it's an easy drinker (especially on a stinking hot summer's day), pretty light on the palate and with a somewhat dank and dry finish. They've marked its release with a video – and you'll find it at their Hops and Holes events in Queensland too.